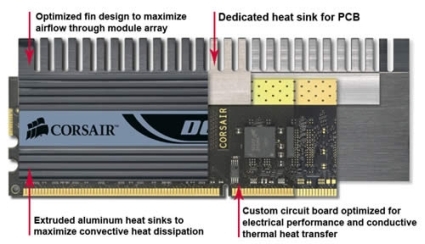 Corsair has introduced world’s fastest DDR2 RAM clocking at 1111Mhz in response to OCZ’s PC2-8800 Gold Dual Channel RAM. The two variants availiable in Dominator series are: XMS2 PC2-8500 CL5 and XMS2 PC2-8888 CL4. The overclockability and cooling mechanism in of Dominator series are worth to mention. In addition to DHX cooling mechanism we have an optional Dominator airflow fan that boosts cooling.